However, sometimes it might be difficult to find the one in the most desirable location and your standard of comfort when you don’t know the city. 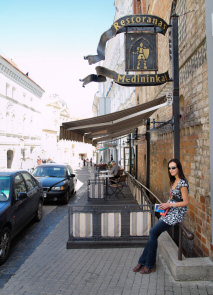 To save you some time on research we decided to feature some hotels in Vilnius of our choice. During my years of travelling I came across this very convenient to use booking company, which I prefer to use when travelling anywhere in Europe. They offer genuine reviews from people who stayed in the hotels and good deals. On several occasions I managed to save up to 75% on my booking. Click here if you are intrested in checking out their offered hotels or if you want to see a list of our recommended hotels stroll down to the bottom of the page and click on the links. We focus on the ones conveniently located in the Old Town and the City Centre and also the ones that receive some of the best reviews from other travellers. As I discovered most hotels in Vilnius more than meet international standards. They are comfortable, clean, secure and provide all modern facilities. Most of the places accept international paying cards. The staff at the front desk speaks English and some other languages. Hotels are a good option for those looking for a holiday’s break from all the daily chores as a lot of the hotels provide breakfast, laundry and dry cleaning services. Most of them have restaurants, health fitness clubs, free parking lots and conference halls. Its wise to book a room in advance as hotels in Vilnius and other places to stay may get heavily booked in summer time or during festivals. Some hotels in Vilnius also cut their prices at the weekends. For those who don’t fancy big and crowded hotels, small boutique or family run hotels would be the best option. Privately owned Vilnius hotels are often aiming to create a more at home atmosphere. As they are usually more cosy and intimate and you get more attention to your individual needs from the hotel staff. We divided hotels into two categories luxury ( upmarket 4 and 5 star hotels) and budget (ranging from midrange to the cheapest ones ).